Jeff Brewer was born in Dallas, Texas in 1978. He, along with his twin brother, and parents lived in Rowlett, Texas throughout the 1980s and 1990s. He attended high school in Garland, Texas at Lakeview Centennial High School, where he lettered in soccer; he also spent a considerable number of years playing club soccer with multiple Dallas area club teams. In the fall of 1996, following graduation from high school, Jeff Brewer began studies at Southern Methodist University in Dallas. He played soccer on the SMU men’s team and graduated after four years in August 2000 with a bachelor’s degree in Political Science. In 2002, Capt Brewer began graduate studies at Boston University’s Institute of World Politics, in Washington DC. In May 2004, he enlisted in the Marine Corps, becoming an 0311 Rifleman and scout with reserve unit Delta Company, 4th Light Armored Reconaissance Battalion in Quantico, Virginia. In January 2005, Private First Class Brewer went to Officer Candidate School and earned his commission as a Second Lieutenant in March 2005. At completing The Basic School in September 2005 and receiving the 0203 Ground Intelligence Officer MOS, Second Lieutenant Brewer finished Infantry Officers Course and Ground Intelligence Officers Course, consecutively. He then reported to his first duty station at the 3rd Marine Division G-2 in May 2006. Weeks after arriving in Okinawa, Second Lieutenant Brewer was sent to 2nd Battalion 3rd Marines (2/3) in Hawaii in early June 2006 as an individual augment to be the battalion’s assistant intelligence officer, and deploy to Operation Iraqi Freedom with 2/3 in September 2006. In March 2007, Second Lieutenant Brewer was promoted to First Lieutenant. In April he returned from Iraq. First Lieutenant Brewer returned to Okinawa in late May 2007 and assumed duties as lead G-2 exercise planner for 3d Marine Division’s role in exercise ULUCHI FOCUS LENS 07. In the fall of 2007, 1stLt Brewer completed the Surival, Evasion, Resistance and Escape course at North Island, California and then returned to Okinawa and participated in exercise YAMA SAKURA as the G-2’s collections officer. In January 2008, First Lieutenant Brewer joined 3rd Reconnaissance Battalion as a platoon commander and went to Basic Airborne Course and Marine Combatant Diver Course through the first half of 2008. In late summer, his platoon began formal workups for the 31st MEU’s 2009 deployment cycle, and First Lieutenant Brewer and his platoon graduated the Urban R&S course. From January through February 2009, First Lieutenant Brewer’s Amphibious Reconnaissance Platoon (ARP) deployed to Thailand with the MEU to participate in exercise COBRA GOLD. In April, the MEU deployed to the Philippines for exercise BALIKATAN where the ARP completed the Multi-Mission Parachute System qualification at Clark Airbase. Also in April, First Lieutenant Brewer was promoted to Captain. In the summer of 2009, the 31st MEU deployed to Australia for two months to participate in exercise TALISMAN SABRE. After returning to Okinawa and the 3rd Reconnaissance Battalion in August 2009, Captain Brewer went back to 3d Marine Division’s G-2 and worked as the Operations Officer from September through December 2009; he worked two exercises, CALTROP and YAMA SAKURA, during this time. In December 2009, Captain Brewer transfered to Marine Corps Base Hawaii and was reassigned to 3d Battalion 3d Marines (3/3) as the battalion’s intelligence officer. In May 2010, he deployed with 3/3 to Afghanistan, returning in December 2010. 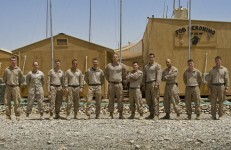 He conducted a second deployment with 3/3 to Afghanistan in November 2011, returning in May 2012. In 2012, Captain Brewer received orders to Dam Neck, Virginia, where he works as an instructor. Jeff Brewer’s personal awards include the Navy Commendation Medal and the Combat Action Ribbon with a gold star in lieu of a second award. He is married to the former Lindsie Oyen. They have two children, Brooke and Jackson.